UPDATE! I have received so many requests about selling these towels and I am happy to announce that I have just opened up an Etsy shop and these are now for sale! You can see them in my Etsy shop HERE. I’ll be adding more products soon, but I know how many of you have been patiently waiting for these to go on sale. Hey everyone! Today I’m sharing my latest project that features a little kitchen humor. While country music is definitely my all-time favorite, I like to consider myself well-rounded when it comes to music. I pretty much like everything. 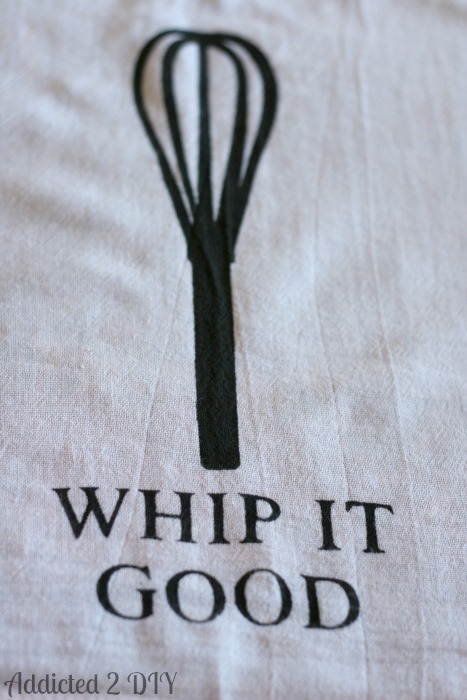 I thought it would be fun to make some kitchen towels that had a funny musical twist to them. 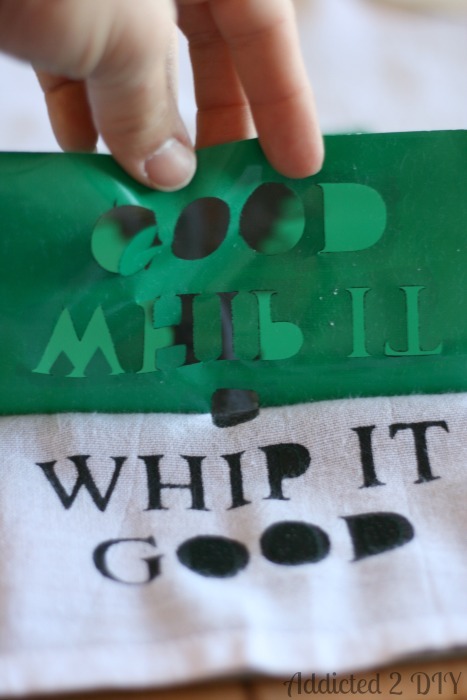 Enter Michael Jackson’s “Beat It,” Devo’s “Whip It,” and Snoop Dogg’s “Drop It Like It’s Hot.” I changed them up to have a kitchen reference (although Weird Al Yankovic did sing “Just Eat It”) and created some fun stencils to make kitchen towels. I’ve included the links for the free SVG files I made for these stencils at the bottom of this post. First I cut my design out on my Cricut and then centered it onto the bottom of the towel. I also laid it out on a mat to protect the table underneath. These towels have a fairly loose weave to them, so some of the paint definitely soaked through to the mat. Using my foam brush, I dabbed the paint onto the vinyl stencil over the entire design. Once I painted the entire design, I carefully peeled up the vinyl. I used my weeding tool to peel up the centers of some of the letters. The paint was still wet, so I had to be careful not to get any on the towel. And here’s the finished design! I hung it off of the back of a chair for a while to let it try before I folded the towel. I then repeated the same steps for the other two towels. Aren’t they fun? I’ve now got them proudly hanging in my kitchen. THESE FILES ARE FOR PERSONAL USE ONLY. THEY ARE NOT TO BE MADE FOR RESALE OR THE FILES SHARED WITH OTHERS TO SELL. THANK YOU. I hope you like them as much as I do. I always like to find ways to add some humor into my life. It keeps things fun! These also make great gifts for a housewarming, Mother’s Day, or for the favorite cook/baker in your life. These towels are too cute! Great idea. Stopping by from SITS. Have a lovely week! Thanks, and thanks so much for stopping by! I. Love. These. Towels! I love that you went with just black and they are so simple and graphic. Please share with everyone at our link party!! 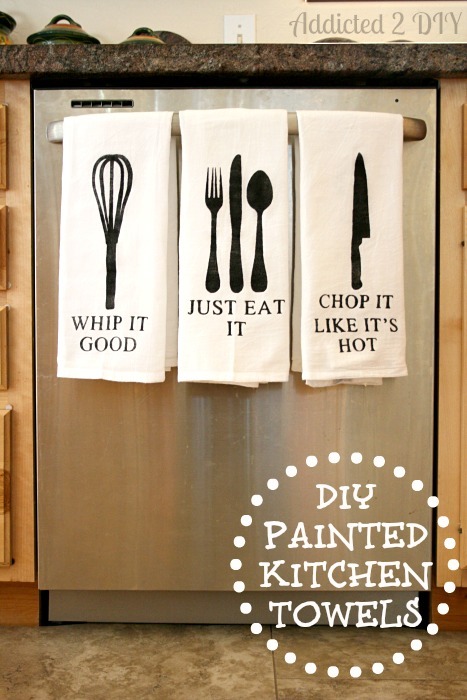 Love these and such a cute idea to go into the kitchen to change things up. What do you do if you don’t have a Cricut? Do you sell the stencils? What do we do if we don’t own a Cricut? Do you sell the stencils? 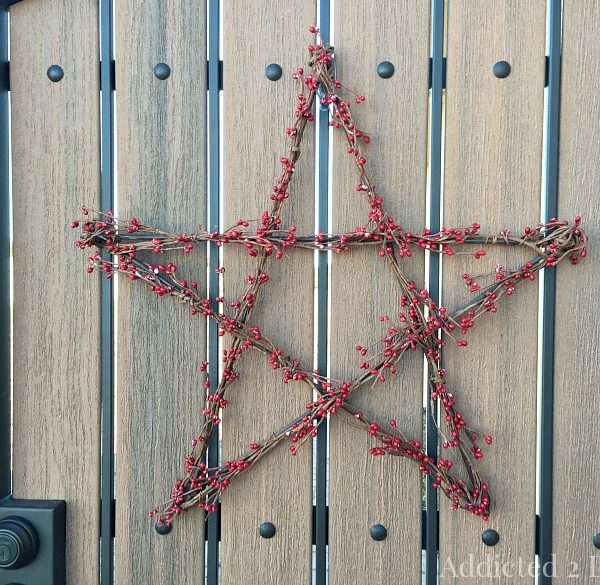 I don’t, but you could always purchase stencil material and use an Xacto knife to cut the designs out and then use letter stencils. Martha Stewart sells stencil film at Michael’s. It’s a bit more labor intensive, but it should net you the same results! How does a cricut know to cut them? Can you program it on your computer or do you have to buy a specific cartridge? These towels are really cute! These towels turned out so cute and I love the cheeky sayings. I can see this as being a super adorable addition to a bridal shower or wedding gift. So fun! Sending some SITS Comments LOVE! Really, these are too cute. I love how Snoop Dog was once so “out there” and now he’s mainstream. Once a flew a red eye flight from Los Angeles to New York between two men who work with Snoop. It was tough to get to sleep… just because these men were both much larger than me and carried on a conversation while I tried to shrink even more and get some zzzzs in before arriving in Boston at the end of my journey!! That is really cool, although I’m sure a bit awkward to be stuck between them;) Thanks for stopping by! Are you kidding? These are all sorts of fabulous! 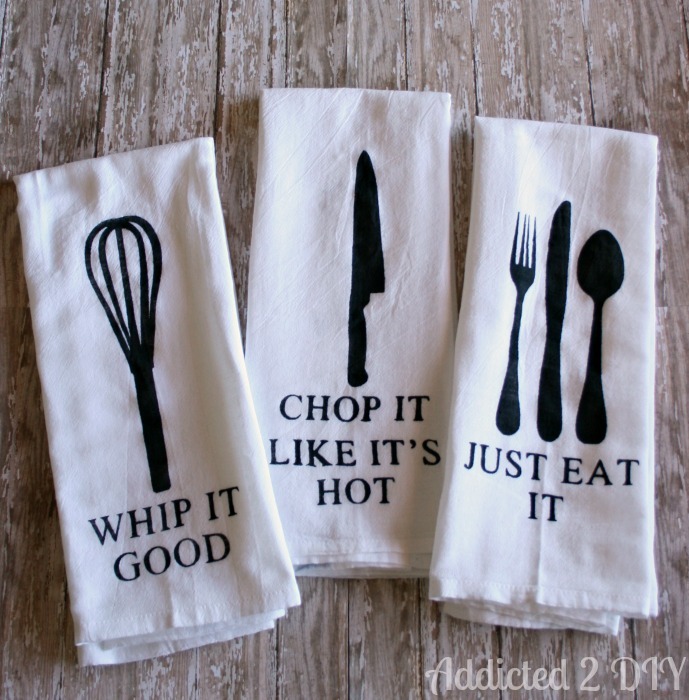 These would make a great gifty for the cook who has everything! Kerri (TheMaven) recently posted…Jambox is Red and AT&T is blue, and together they have a fantastic Valentine’s Day gift for you! These are hilarious! On looks alone, they would fit into any decor and are very classic and classy, then you read the sayings and have a great chuckle. Maybe I really appreciate them because I remember every one of these songs too. Love it! Great project! They look great. Heh now these are really fun. You should consider making more and selling them on etsy. I’ve thought about it. Thanks! I love these! So crafty and cute. I’m sitting here sitting “Chop it like its hot”. LOL Great design. I need to get a Cricut. I didn’t realize all that you could do with one! OMG these are too funny! I love them. Very clever Katie. Oh, I so wanna do this! How fabulous. Can it really be that easy? I’m a perfectionist who could never color within the lines. 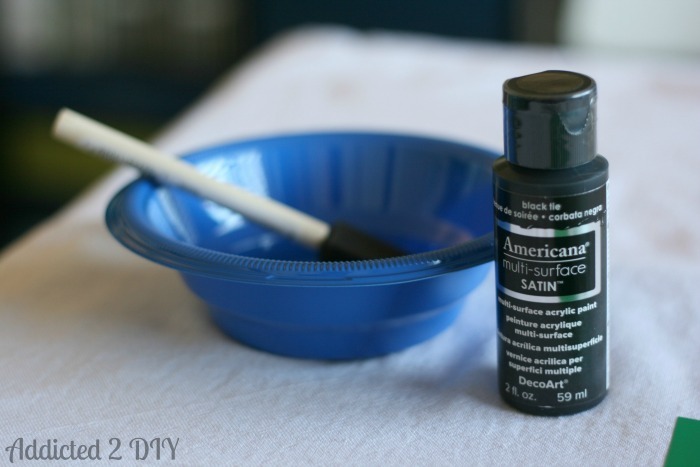 I think it has something to do with patience… lol Stopping over for some #SITSBlogging love. Stenciling means you never have to stay in the lines;) thanks for stopping by! I am so glad I found your blog. I love these and many of your other posts too. Kathleen recently posted…Ahh!!!! Valentine’s Day is just 2 days away!!!!! Such a cool idea. I may have to look into making these. Stopping by from The SITS Girls. Julie recently posted…Free Valentine’s Day Gift for You! I’m not typically a crafty person, but this are so awesome, I’m tempted to give them a try! Fantastic and so funny! Thanks Katie! They’re super simple. These are sweet looking kitchen towels. I love the culinary spin you put on the song titles! This is such a great idea. It’s a perfect way to have one of a kind towels for your home or to give as gifts. Stopping by from SITS. Way cute! I need whatever this Criqut thing is so I can make something like this! We’re HUGE music lovers (and we love country too, being the rednecks that we are over here lol) but I would have never thought of this project! Stephanie recently posted…Dark Chocolate: Tasty and healthy too! Thanks! You would love having a Cricut! Love them!! They’d go great with some funny dessert plates I recently made. Pinning them!! 🙂 Sharing the #SITSBlogging love! LOL these are so great! LOVE these – not only are they cute, but they’re hilarious too! Thanks for linking up to the makers! Super cute! I will definitely have to keep these in mind to make. What a great Christmas gift or housewarming gift! These made me smile! So very cute! Thanks for linking up at Hit Me with Your Best Shot– have a wonderful week! I adore these towels! I can’t wait to whip out a set of my own! Thanks so much for the inspiration! Thanks for sharing! What a fun idea! Great job! Any chance you’d consider making these available for purchase? I’d love to buy a set! I’ve thought about that. I have had several people ask the same question. These are fantastic! Thanks so much for sharing the files – can’t wait to make a set for my kitchen! Thank you Lisa! So glad you like them! First it’s awesome! Going to make one as a present. Many thanks for sharing. May I ask which font did you used? 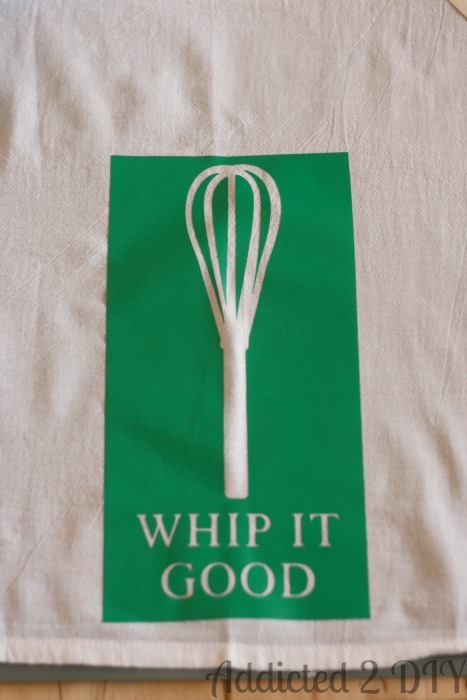 I may want to create some more sayings for an matching apron. Thank you! I wish I could remember which font I used. I want to say Georgia, but I can’t be positive. These are great! Would you consider making and selling another set? I have definitely considered that, and I soon do so. Great will you email me when they are available for purchase? rubiazulauren@gmail.com. I’m assuming you have to have the Explore to download the files. I can’t get them in my Craft Room. The designs are great. LOVE LOVE these can’t wait to try and make a set and thank you for including your template. Awesomeness. How do I make this stencil of you don’t have a cutter? It would be pretty hard to do without a cutter, but it could be done with a craft knife. It would just be really tedious. What model cricut do u use? I have a Cricut Expression. I just happen to also have an old program where I can also cut all of the images I would like. To cut these files, you would need either a new cricut, silhouette, or other cutting machine. Thank you so much for sharing this and the files. I cant wait to cut it out!!! These are absolutely darling, and I want to make them. Quick question… Where did you get the vinyl? Thank you! I got the vinyl from Expressions Vinyl. They ship really fast and their vinyl is awesome. The kitchen towels look great and beautiful. I can’t believe that you did it with yourself. Thank you for sharing such a wonderful idea. Hi, I wanted to ask whether its possible to purchase the kitchen towels? I have a cricut but have only ever used the files they have on the machine. If I download your files how do I use them on the cricut? I want to try to make these this weekend, I love them! Which Cricut do you have? If you have the explore, you will be able to cut the files. If you do not, you probably won’t be able to cut them without finding Cricut images that are similar. This looks great! I have a lot of ideas for stencils but am struggling to find the right material at a reasonable price. The vinyl worked so well, though; where did you find it * how much was it? I purchase it online from Expressions Vinyl. I believe it’s around $1.50 a sheet. I don’t know if you are aware but you can cut the design template out of freezer paper and iron it on to the cloth. Comme ça: http://prettyprovidence.com/diy-freezer-paper-stencil-shirt/. I have heard of that. At the time, I had no idea about little secrets like that;) I’m going to have to give it a try someday. i love this, but i dont want to actually make them. would you make a set and sell it for me? sam recently posted…How I killed a cupcake… with love. 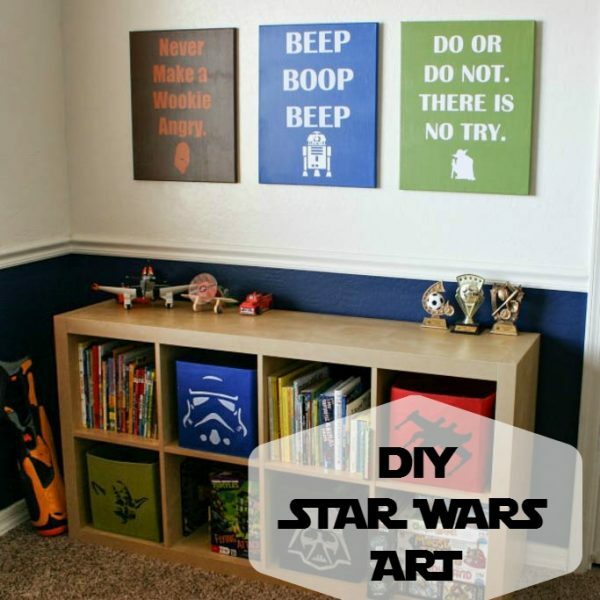 Hi, I have downloaded the files but I cannot figure out to how to download them or save them a different way so that I can use them on the Cricut. Do you have instructions for this? Which Cricut do you have? If you have the Explore, you should be able to use the SVG files. You just import them to your design space I think. My paint runs under my stencil. Do you have any suggestions on how to prevent this? To help prevent the paint bleeding under, make sure you don’t have too much paint on your brush, sponge, etc. 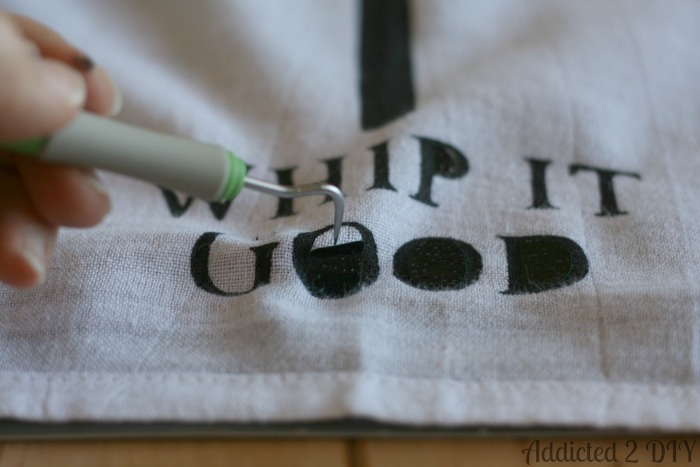 Then dot it on the towel rather than using a brush motion. I hope that helps! Oh golly… these are beyond amazing!! Thanks so much for sharing the process after you tell us you’re selling them! Such a true crafter to still share the love after the option of making money. I followed your directions explicitly, including the same paint, but my paint bled underneath:((. Any ideas what I could’ve done wrong? Thanks so much!! It’s possible there was too much paint on your brush or the vinyl was not completely flat on the towel. Without being there to see it, it is hard for me to come to an exact conclusion. I was thinking of doing this.. but originally thought this was an iron on.. I bought the iron on circuit material to do it but now I’m second guessing myself and thinking about doing the paint. Do you think it might be easier to do the iron on? You can definitely do the iron on! Can I pay you to make me the stencils? Could I use this design for a Christmas present for my sister-in-law? If you don’t mind could you email me? Thanks! Of course. I will email the files shortly. Love these! Would love to make a set for my mom and mother in law for Christmas would for you to send me the files! Due to the overwhelming requests, I’ve decided to update the post with the files. Please just remember that these are for personal use only. Thank you so much for your support! I just want to say that I absolutely adore these towels! Is there any chance you still are sending the templates privately? 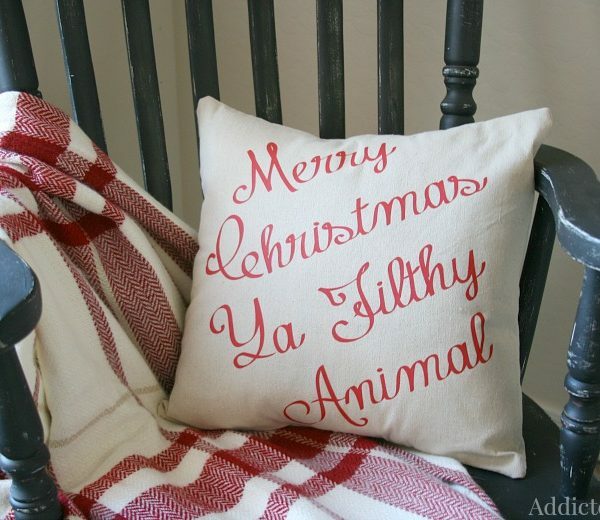 I’d love to make these for my step-mom for Christmas. After the overwhelming response, I decided to update the post to include the files again. Please just remember that these are for personal use only. Thank you for your support! I have gone ahead and updated my post to contain the SVG files. After the overwhelming response, I decided to upload them again. Please note that these are for personal use only. Thank you! Could you please email me the file for these towels? I would love to make them for a gift for my sisters! I have updated my post to once again include the SVG files. I just ask that people remember that these are for personal use only and not for resale. Thank you! Does this paint stay on when you wash them or do you have to use a specific adhesive to keep the paint intact while you wash? I used a multi-surface paint and it did fade a little after a few washes, but the designs still look great. I’m curious, is there a reason you used fabric paint instead of heat transfer vinyl? I’m making a handful of these as gifts and was wondering how well the vinyl is to re-use, so that I don’t need to cut out new stencils for each set. FYI, my first set look amazing! You’re probably going to want to use new vinyl for each towel. 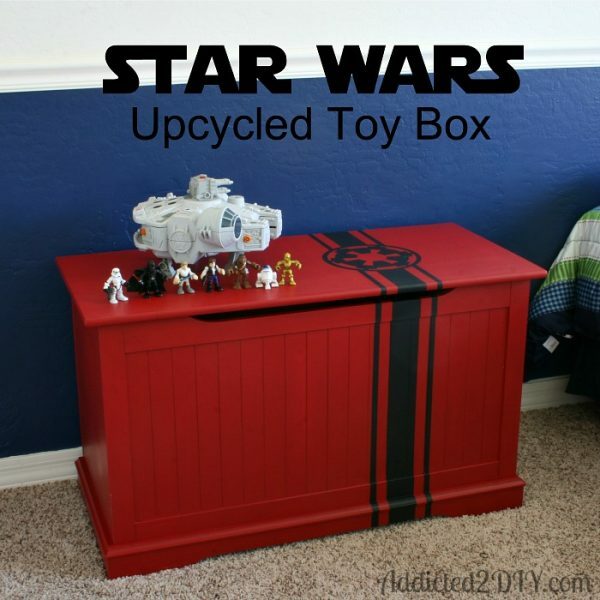 You can try reusing it, but it won’t stick as well with each use and may tear when you’re peeling it up. I’m glad your first set was a success! Hi there! I am trying to download the files to make these towels for myself, but unfortunately when I click to download them, it doesn’t do anything. Hi Courtney, so sorry for the late reply. I clicked on the links and they worked for me. Would you be able to try them again and let me know? Thanks! The links only bring up internet explorer images. The files are not compatible with the Silhouette program. The files are SVG files that you can download and save to your computer to then upload into the Silhouette software. I am having trouble downloading the images using the links. 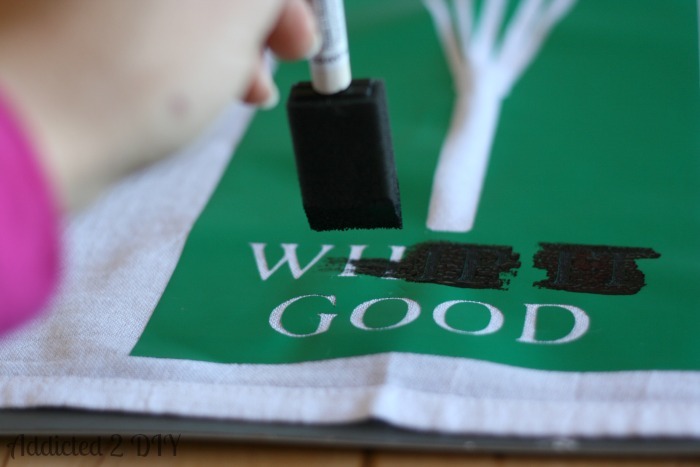 I’m getting a Cameo soon and am already finding my projects I want to do when it arrives 🙂 I have a question about the process…for the letters with a negative spot like O in your tutorial, I’m assuming it’s a one time use of the stencil if you are picking the center of the letter off the fabric after painting. Does that mean you are making a new stencil any time you want to make a towel? Or is there a way to reuse the stencil so you can make a set of towels for a few friends at the same time? Thanks! Yes, you’d be making a new stencil each time. It would be really difficult to reuse the stencil, given that it is vinyl. I’m not sure it would hold up well to being peeled off and stuck back onto a new towel. I’ve scrolled through the comments here, but either missed it or it isn’t here…which vinyl are you using? 651 or 631? I’ve only ever used htv for fabrics but was obviously for iron on images. Since this will be removed is 631 best? Thanks! My mother in law and sister in law will love these!!! Yes, you will want to use 631 for this in order to be able to easily peel it off. I am trying to download the files to make these towels for myself, but unfortunately when I click to download them, it doesn’t do anything.